Vijayadashami is also known as Dussehra, which is celebrated throughout India and has now reached leaps and bounds across the world. 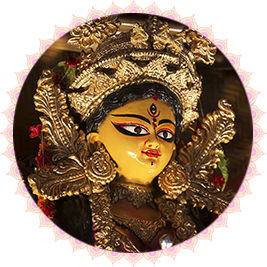 It is celebrated for different reasons in various parts of India and symbolizes the end of Durga Puja. Ayuda Pooja is celebrated during Ashvin month, which falls between September and October. It also characterizes an admiration for the attributes of the Divine Shakti (Power) being incarnated as Goddesses Durga and Saraswati to destroy evil and develop the art and culture of the country. Usually, all the Vijayadashami celebrations come to a head with processions of clay Deities of Durga, Lakshmi, Saraswathi, Ganesha and Kartikeya, accompanied by music and chants, to the river or ocean. The images are then immersed in the water body after paying homage to the deities with great reverence and respect. Navratri is a festival of great importance and significance for all and embodies the virtues of feminine Divinity. The festival symbolizes the triumph of good over evil highlighting the attributes of day to day living, with reverence to all the objects that contribute to our well-being. The three basic qualities of Tamas, Rajas, and Sattva basically define the essence of Navratri. Adhering to these qualities will shape life. Conquering these basic qualities will lead to the path of Liberation. This day of Vijayadasami indicates not only the victory against evil but also against the negative aspects of every individual. The origins of Vijayadashami are steeped in mystery and can be traced back to various mythological tales and legends. It is said that Goddess Durga, incarnated with the combined celestial energies of all the Gods to vanquish the evil demon Masishasura, who wreaked havoc on the world with his evil deeds. There ensued a terrible battle for nine days, with the Goddess eventually prevails over the beast and slaying all the evils. She finally restored peace in the world. Vijayadashami also commemorates the Victory of Lord Rama over the powerful king of Lanka, Ravana, who strayed from the path of righteousness to satisfy his ego and betrayed his adherence to Dharma. This forms the crux of the Holy epic Ramayana and the incarnation of Lord Vishnu as Rama to restore order in the world. Vijayadashami is celebrated with great fervor and piety and people fast on all the nine days to display their devotion and indicates the prevalence of good over evil. People wear new clothes and visit the Puja Pandals to pay obeisance to the Deity and prepare traditional food at home. The plays of Ramayana are enacted on all the day, eventually leading to the effigies of Ravana being set alight with fireworks indicating the victory of good over evil. The Festival also marks the preparation of Diwali, the festival of lights when Lord Rama eventually reaches Ayodhya after a long hiatus and sojourn in the forest. The day is also observed with the Visarjan (submersion) of the Idols of Goddess Durga which mark the culmination of the nine-day festival of Vijayadashami or Dussehra. It is a celebration of victory. The conquest of Good over evil. To destroy all evil in the lives, and protect as an amulet against all negativities of the life. To bestow benevolence in the lives, and to bless abundantly with all wealth and opulence.